Where can you find these content creators? Look to your customers! Many businesses are discovering how beneficial content created by customers can be to increasing conversion rates and lead generation. All it takes is handing over your content creation checklist to your social media followers and influencers to gather user-generated content (UGC.) User-generated content not only saves you time and resources, but it also establishes a stronger trust with an audience who is more likely to convert from UGC. User-generated content is self-explanatory; it’s content that users, rather than advertisers or marketers, create. Brands often turn to influencer marketing for UGC, but user-generated content doesn’t always have to involve a network of social media gurus or bloggers. Users can be your favorite customers, loyal supporters, or new converts who are interacting with your products for the first time. Any user who has access to your brand or products, and is able to create content for your social media or website, can produce UGC that positively impacts your brand. Just under half (46%) of top-performing content marketing teams rely on UGC exclusively. UGC is wildly popular among brands big and small, but how does user-generated content compete with branded content from professionals on your team? What sounds cheaper: hiring and transporting a photography crew out on location to photograph your products for a whole day, or sending a product to a handful of travel bloggers who are currently living it up in Bali, Thailand, and Fiji? The second option is definitely cheaper, and will probably get you better photos! One of the most appealing benefits of UGC is the price tag. UGC-based ads can reduce your cost-per-click by 50%. Influencer marketing often requires the cost of shipping a few free trials of your product in exchange for photos that are distributed to a loyal audience. Asking for reviews of your product or brand doesn’t cost a dime; it can be done at the end of every email you send. The low costs of UGC help to boost your ROI. 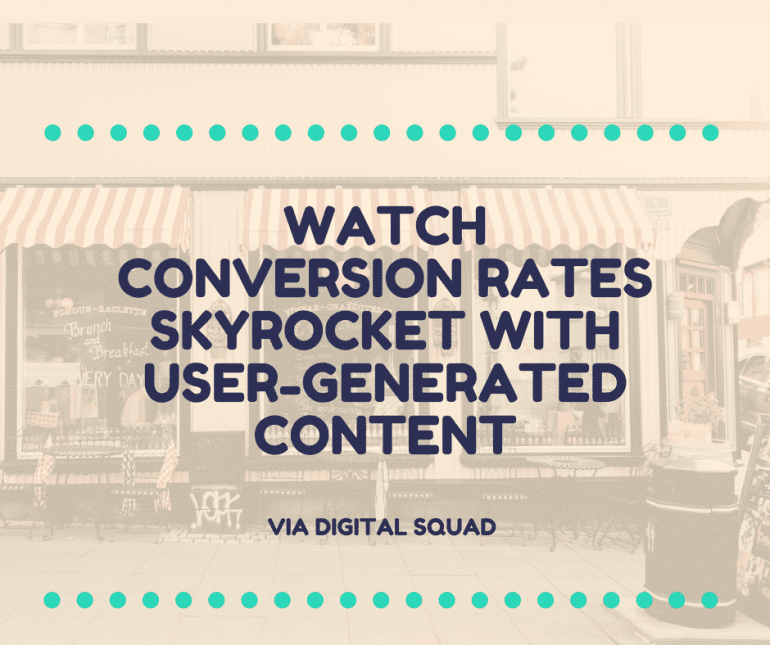 The high conversion rate from UGC helps to boost your ROI even further. UGC also gives your team more opportunities to conduct A/B testing and see what content resonates with your audience. If you send out two similar pieces of content that were created for users, you can collect free data on what content you should create moving forward. One of the benefits of UGC is that you save on your content creation budget and other users know that they are not viewing advertisements or marketing content that was paid for. (Influencers do have to disclose that they are involved in a partnership with a business, but everyday customers who give free testimonials and photograph products do not.) When users see content that was genuinely made for the love of a product, they are more likely to trust that your business has quality products that people want to buy and use. Three out of four users claim that UGC is more authentic content. Most UGC is visual, or can be accompanied by visual. We all know the importance of using visuals in our overall content marketing strategy. This content is more likely to have higher engagement rates, be shared across social media platforms, and catch users’ eyes as they scroll online. When you are creating a UGC strategy, think about how you can get users to take photos and videos that advertise your products or services. Picture yourself in a new city, looking for a place to eat. You see two restaurants side by side; one has a line out the door of excited customers. The other place has absolutely no one inside, but the owner is yelling at you, asking you to come in. Which restaurant do you think will have better food? Social proof is the idea that when people see others enjoying a product or a business, they are more likely to be convinced to join in the fun. UGC is a digital “line out the door.” Seven out of ten customers trust a customer review over marketing content. When people see others enjoying a product, they are more likely to become a customer…and stay a customer. Customers who are referred to a brand by a friend or peer have a 37% higher retention rate than other customers. It speaks directly to millenials. It’s no secret that millenials are a hot target market. If you are trying to reach this generation, UGC is a requirement for your overall content marketing strategy. Millenials can see through advertisements and know when they are being sold to; 98% of millenials would rather interact with a friend’s post than a brand’s post. If their friend is advertising your brand with UGC, however…you get the idea. Over two-thirds (68%) of millenials believe that UGC is a sign of high-quality products. Millennials trust UGC 50% more than brand-generated content. UGC is 35% more memorable and 20% more influential to millennials than brand-generated content. Millenials want to create and consume UGC. Give them the opportunity to do so and enjoy how much more content you will get for your overall budget. Have a plan for your UGC before you reach out to potential content creators. UGC on Instagram or your landing page may look different or may be directed to people along different parts of the buyer’s journey. If, for example, you are looking to curate Instagram posts, you are more likely to get responses if you reach out to content creators on Instagram rather than your email list. UGC is often flexible enough to be distributed through multiple channels, but plan out where you are going to place different types of UGC before you ask for it. Did you know that user-generated photos are five times more likely to convert users than non-UGC? Lighten the load on your Instagram and Facebook budgets by reaching out to supporters for social media content, including photos. If you can set up an effective hashtag where users can put their content, all you have to do is pick and choose the best photos for your business. Check out these user-generated content campaigns on Instagram for inspiration. Ecommerce stores can give users the chance to review (and view reviews of) individual products right on product pages. After customers buy these products, send out the opportunity to give the product 1-5 stars, whether they would recommend the product to others, their personal experience with the product, etc. Collect this data and add it to the bottom of the product page so potential buyers can get an honest look at how the product has worked for other people. Businesses may benefit from handing blog content creation over to users. Guest posts give aspiring bloggers the ability to tell a story about their relationship with your brand or products. Offer this opportunity to influencers or customers who are especially excited about your business, but be sure to edit and optimise these posts before you publish them. Testimonials are a class form of user-generated content. These are easy to obtain and share on your landing pages. If you are adding a testimonial to your website, consider collecting a photo of the customer giving the testimonial or a video of the customer’s testimonial. If a customer sees that someone who looks like them enjoys your business, they are more likely to see themselves enjoying your business as well. Plus, as we mentioned earlier, users respond to visual content. Having trouble getting enough UGC from followers and customers? Add an incentive. Offer discounts for email subscribers who leave a review of your products. Create a contest on social media that asks followers to create high-quality photos for free products. If your customer knows that they can directly benefit from creating content, they will be more likely to engage with your brand and leave reviews. Once you’ve collected UGC, where are you going to put it? How does UGC fit in with your overall brand message? If you don’t have a comprehensive content marketing strategy, the work you put into collecting UGC may not give you the results that you want. At Digital Squad, we take you through each step of researching and planning an effective content market strategy. We combine our expert knowledge of SEO with experience in creating high-quality content that will reach and convert customers. No matter where you want to see users move through the buyer’s journey, we can help you meet your growth goals and expand your business. Reach out to a Digital Squad representative today to learn more about creating a content marketing strategy that delivers results.